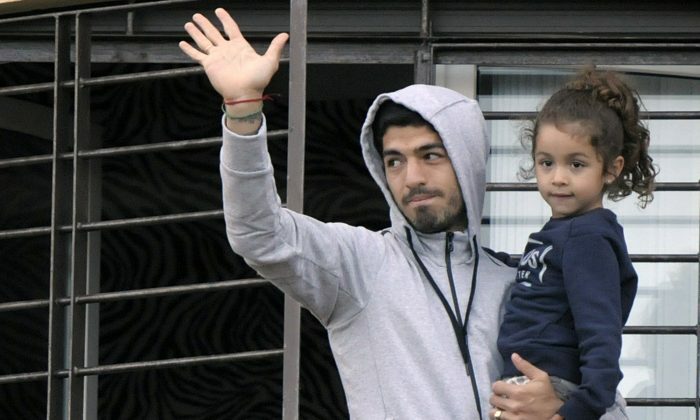 Luis Suarez could be on his way to Barcelona very soon. Liverpool and Barcelona held transfer talks recently, and a £63 million fee has been agreed, according to Catalan station TV3. The Merseyside club had earlier refused to sell Suarez for anything below £75 million, but shifted their stance when Suarez declared that he does not want to stay with Liverpool any more, according to Metro. If deal works out, Suarez will be traveling to Catalonia soon to sign a 5-year contract. Suarez was recently banned from all footballing activities for four months by FIFA for biting Italian defender Giorgio Chiellini. BELO HORIZONTE, Brazil (AP) — How is it that footballers are among the few who’ve not had much to say about the bite seen around the world, now punished with an appropriately tough ban? Luis Suarez’s peers surely can’t all be fearful that he might chomp them next if they voice an opinion about his penchant for man-flesh. Some of his teammates and his latest victim, Giorgio Chiellini, told their (conflicting) sides of this bizarre story. But other players are too busy trying to win the World Cup to worry themselves with the Uruguay striker, what football should do about him and whether the punishment FIFA meted out Thursday fits his crime. Their broad silence, punctuated by few exceptions, has been deafening when the rest of planet football talked and tweeted up a storm about Suarez fanging the Italian defender’s shoulder and now being sent home. FIFA, a deserved target for criticism on so many other levels, did well with its swift, measured justice in this case. Excluding the man-toddler from the rest of the World Cup means football can get back to focusing on the fabulous play at its showcase tournament and less on Suarez’s psyche and need of a pacifier/muzzle. Instead of blindly closing ranks, trying to defend the indefensible and pretending he is the victim of a conspiracy, now is the time for teammates and Uruguay officials to sit in a semi-circle around Suarez and one after the other explain how he is letting them and himself down. Peer pressure might be more effective than simple punishment in moderating his behavior. They could help themselves by helping him stop ruining what should be a glorious career, given his skills with a ball. FIFA’s four-month ban from “any kind of football-related activity,” fitting given his history as a repeat offender, plus a nine-match international ban should hopefully have the smelling-salts effect of hurting Suarez’s income. Smart sponsors should cut him off as they eventually did with Lance Armstrong. If they don’t, then, by association, they are encouraging his behavior. Buyers who’ve sniffed around Liverpool to test whether the club will part with the Premier League’s top scorer last season also should look elsewhere. Handing over squillions for Suarez now would make them complicit and allow him to believe that club bosses don’t care if he bites opponents just so long as he beats them. But Liverpool should both publicly condemn and stand by Suarez, as it did in the past, and again show that its motto — “You’ll never walk alone” — means just that. Educate Suarez by offering him a carrot to go with the sting of FIFA’s stick. Make Liverpool’s support conditional on him accepting counselling and understanding his behavior from his victims’ perspective. If he hasn’t already, he should be made to meet with Otman Bakkal, Branislav Ivanovic and now Chiellini to hear how unpleasant it was to feel his teeth sink into their bodies. Liverpool should do all this to show that football doesn’t tolerate bad behavior but also won’t tolerate leaving players alone with their demons. Ostracizing Suarez would feed mob cravings for a hanging but alone won’t save this conflicted talent. Understandably, players have cut themselves off to minimize distractions in Brazil. Distractions don’t come any bigger than man eats man. A standard reaction when asked about Suarez was that of Mamadou Sakho: the France defender and Suarez’s Liverpool teammate laughed, motioned to zip up his mouth and walked away. Modern footballers are a disenfranchised lot, spoken for in the sport’s corridors of power by retired players, bureaucrats and mostly older men. It would be wrong to think that footballers don’t have an opinion. But most aren’t asked or paid for them until after they’ve retired and become media pundits. And some truly won’t care. Some won’t see Suarez’s behavior or anything beyond winning the next game as being their business. Footballers have shown they care about other issues in their workplace. When Brazil’s Dani Alves was racially taunted by a banana-throwing spectator this season, other players expressed solidarity by posting pictures of themselves eating bananas. Now players should tweet pictures of themselves with plastic Dracula fangs to show that on-pitch violence bothers them, too. They should speak out on Suarez, on biting, stamping, spitting, match-fixing and any other intolerable behavior by one player against another. They should become guardians, not mere bystanders, of a code of acceptable behavior in their profession. Tell Suarez publicly and privately, and any other out of control players who forget this is a game, not war, that enough is enough. By doing so, perhaps they’ll help save Suarez, too.